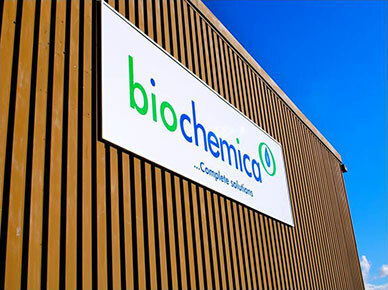 Biochemica Water Ltd specialises in water and wastewater treatment services and chemical products, providing a bespoke and comprehensive range of traditional, innovative and environmentally-friendly solutions to our clients across the UK and Ireland. Our scope, experience and abilities are incredibly varied, and as a solutions-focused company, Biochemica is confident in tackling all manner of water-related challenges. Biochemica’s nationwide professional and experienced technical teams deliver water treatment programmes across multiple industries, including commercial, domestic and industrial systems, across the private and public sectors. For more information about Biochemica Water Ltd, Contact Us today, or download our brochure (pdf), and follow us on LinkedIn, Twitter, Facebook and Google+.